I am moving my blogs to this new site. On my last site, I included blogs about my recent survival from an amniotic fluid embolism. I realize people are still reading these, so I have included them all here in this blog for anyone to reference. They go from the latest one written down to the oldest. Currently, I am doing well! Here is a recent family photo taken just 7 months after the incident! This week marks three months since my Amniotic Fluid Embolism. On Friday, I will go into Mayo for an Echo of my heart. This will be the moment I find out if I can take off the defibrillator. If my heart hasn’t recovered, they will place a defibrillator in my chest. I am feeling good these days and am feeling confident that my heart has recovered. We’ll soon see! It has been a while since I have blogged, and part of that has to do with being busy raising my two children, but the other part is that I didn’t even know where to begin to talk about all that has happened and all that I have gone through. This will hopefully shed some light on the past three months since returning home from the hospital. About a week after I returned home from the hospital, a Mercy Gilbert Hospital nurse called to check up on me. She explained that even though I do not remember the nurses that attended to me, they really remember me and that it would mean the world to them if I ever had the chance to stop by. Hearing that, I grabbed my husband, my father-in-law (who was staying with us at the time) and the kids and jumped in the car to surprise the nurses. When I arrived, there were a few nurses there who ran to gather all the other nurses. Some of them were weeping and hugging me and asking me all kinds of questions I didn’t remember. From the looks on their faces, this had impacted their lives. The hardest thing for me was not remembering something I was involved in that made these total strangers break down and cry. A representative from the hospital asked me if I would be willing to come back to speak to their hospital leadership team about my experiences. I agreed and returned about a week later to what I thought would be a small meeting with hospital Board members. A staff member escorted me to the meeting and as I approached a woman was walking along side us heading towards the meeting as well. When she heard the other woman call me Melanie, she stopped, fell against the wall, gasped for air and looked intently at my face and began to cry as she realized that it was me. It didn’t take long for me to realize that my showing up would be a healing experience for those who cared for me. They needed to see me alive. The last time they had seen me, I was being wheeled off in an ambulance to Mayo Clinic and the certainty of my survival was slim. They never received the closure they deserved after all they had been through. When I walked into the room, there were over 100 doctors, nurses and staff crammed into this small Board room. Some, I heard later were turned away because there was no more room. As I entered, again I heard people weeping and tissues being taken out. My husband, mother, sister Kym and baby Ella joined me, and we were all introduced. A staff member recapped my story for the audience and then allowed me and my family to tell our perspective. After we shared, the hospital representative told me to look behind me where there were about 30-40 people standing. She proceeded to tell me that all of these people helped in my care. I was amazed at the army it took to save my life. Each person then went on to tell me how they helped in my care. As they spoke, I turned to each one and looked them in the eyes, shook their hand and said, “thank you.” It was a moment I will never forget. The anesthesiologist, doctors and staff that performed CPR on me, the nurse who was at my side, the doctor who delivered Ella, the intensive care doctor, and the doctor who performed my surgeries all grabbed and hugged me tight with tears in their eyes. I had never felt so much love from strangers before. But, to them I was no stranger. They were invested. They weren’t just doing their jobs that day, they invested in me as a person instead of a mere patient; I could tell by the looks on their faces. It was a beautiful moment for me to take in. The Intensive Care physician asked me if I remembered him, and for some reason he looked familiar. Then he explained that he came and sat with me when I was recovering at Mayo Clinic. I did remember him coming to visit at Mayo, and I remembered thinking, who is this guy hanging out in my room. It was this new encounter with him that made me realize that he cared so much for me that he came to visit me on his time off to see how I was recovering. I never knew doctors to be like this. As we were leaving, another staff member told me that when I was at Mercy, the cleaning staff member came in to clean the room I had been in during the trauma, and as she entered, she saw an incredible amount of empty bags of blood on the floor. She immediately ran and got the rest of her crew to come in and pray for the woman who lost all this blood. That woman was me. They thought that there was no way I could have survived, but they came in and prayed for me…a total stranger. It’s these kinds of stories that have made such an imprint in my life. The day I came back from revisiting the hospital staff, I began experiencing symptoms from an infection I had contracted while being in the hospital on antibiotics. My road to recovery was becoming a struggle to recover. The infection was so bad that I was losing a great deal of weight daily. I couldn’t eat or drink and was becoming dehydrated which is not good for anyone…let alone someone with heart problems. I was so weak and so tired; I could not even hold my daughter or play with my son. After about a week of not knowing that I even had this infection, I finally went to Urgent Care. The doctor didn’t give me any answers, and I went home and told Doug that if I die again, to know that I have lived a good life and to go on without me. That should reveal to you the state I was in. I did not think I would make it through. I was so distraught and weeping uncontrollably for hours wondering how I could possibly get through this illness. I didn’t have the strength. Then the next day a friend came to see me and took one look at me and said, “We are getting you to a doctor.” She made a phone call to a friend of hers who is a doctor. He said he could get me in right away. I knew I had to go, but I didn’t even know if I could muster up the strength for the car ride, but I pushed through the pain and got into her car. She drove me there and I was seen by this Catholic doctor who immediately put me on an IV of fluids to help with my dehydration. He diagnosed me with the same infection that my brother suspected that I had. It was also the infection that my grandfather had died of just a few days prior. This was even more concerning because I had just witnessed my grandfather suffer through this terrible illness which ultimately led to his death. He had died soon after I had returned home from the hospital. I was scared that I too would die — that the other shoe would drop, that what happened at the hospital was just the beginning. I thought, maybe I was not intended to live. Keep in mind, I was on a lot of medication, pain killers, and had hormonal imbalance from just having a baby. My thoughts were not clear, and I was becoming depressed. This doctor and my brother finally put me on the right track to healing. It took several weeks to cure, and I suffered a lot during that time, but it drew me ever so close to the Lord. Every time I suffered, I offered it up for others, and I prayed constantly. All I could do was pray. All I could do was ask others to pray. Once again, I was able to make it through and I did recover. My mother has come to take care of me every day, all day, for the past three months. She has literally given her life up to take care of me and the children to make sure I don’t overexert my heart. My emotional heart bursts every day I see her. It is as if an angel walks through my door every morning. Motherhood is a sacrifice and I know that, but when you are on the other end of that sacrifice, it is hard to comprehend this kind of selfless love. There has not been a day that has gone by that she doesn’t well up with tears recalling what had happened to me. I hate that her heart hurts from the pain of watching me go through all I did in the hospital. I know she relates to the pain of Mary, watching her child die and being totally unable to control it. I can only imagine how I would feel in her shoes. I cherish every moment with her. She catches me gazing at her sometimes and can’t figure out why I am always looking at her, and I guess it’s that I love her so much and am so grateful for her that I am etching in my memory her sitting there with me loving me beyond measure. I never want these memories to go away. I want them to stay with me forever. Her very presence comforts me. She need not say a word and I know I am loved. She is training me through her example on how to love your children so completely in a way that completely forsakes yourself. I am a better mother because she has mothered me so well. My mom has endured too much these past three months. She witnessed my trauma, and when I returned home, a few days went by and her father died in addition to her mother being diagnosed with cancer. In addition, my brother had his baby five days prior to Ella being born and my mother has not been able to spend the kind of time with him that she does with Ella which I know breaks her heart. I am starting the canonization process for her! Speaking of saints, my husband is another I am signing up for canonization. Before we were married, people asked what made me fall in love with Doug, and one of my responses was that if ever I was on my death-bed he would be the guy standing next to me holding my hand and looking at me with a kind of love that never faded. Who knew that that day would come only three years into our marriage. Doug has endured too much as well. His strength is one only a true man of God could have. At the beginning of my recovery, I was unable to care for the children, so not only did he have to go to work, but he had to come home to take on all the responsibilities of taking care of the kids along with taking care of me and the bills and the chores and etc. At our wedding, the Priest said, “Today should be the day you love each other the least. Every year your love should grow more than the year before.” Wow! He said it best. I love my husband a thousand times more today than the day we were married. He is my superhero! Not only have my mother and husband sacrificed for me, but all my friends and family have too. They have taken turns to come a few hours a day to give my mom breaks. They have brought so much joy to my life. Since I was homebound for most of my recovery, knowing they were coming over would liven me up and Brady too! I am especially grateful to my neighbor Tifni Shroll who when I was at my sickest, would take Brady to her house to play with her children to give him a sense of normalcy and to give my mother and me a break. She is another saint in the making! My father has helped us too by taking over for my mom at times, helping my husband with things around the house, and helping my brother and his wife with their new baby while my mom has been with us. He has such a giving heart! I am so blessed to have the most wonderful family and friends who have stepped in during my time of need to be there for me in whatever ways I needed. I have a grateful heart! On another note, I told Doug today that when all of this is behind us, and as people forget, I will miss the look in people’s eyes when they see me. Today, someone I haven’t seen in years came up to me and did the same thing that so many others have been doing. He ran up to me, took in a deep breath, looked into my eyes with the most loving gaze and said, “It is so good to see you” and then gave me the biggest bear hug. This is an everyday occurrence in my life since the trauma, and it is something I wish every person could experience. All I can say is that I feel the love of so many people that I am overwhelmed. I don’t know what to do with it all. Many times I feel so blessed but at the same time undeserving. I wish everyone could experience these kinds of gazes that reach into the heart of you and reveal and remind you of your worth and how much you mean to them. I used to have such a hard shell and tough exterior, but this has changed me. It has softened me. The Lord has pierced my heart in ways that I cannot hide from. The cares I used to have disappeared and all I want to do is live even more for the Lord and to be a witness for His Truth. I have become a total mush-ball! I feel like in dying and coming back to life, that the parts of me that were walled or calloused have died, and God has peeled back the layers of me as if peeling an onion and the core of me is being exposed. It’s a bit weird and a lot to take in at times. The Lord has given me an invitation to start anew and to regain sight of what is most important. For me it took dying and being a part of this traumatic event to awaken me to being more open to God’s plan for my life instead of trying to be so in control of everything. I have always been a strong and independent woman, but this whole thing has left me weak and vulnerable in ways that I have had to let down my guard and allow others to serve me and take care of me. It’s been extremely humbling. I have had to die to so many things in order to get through these past three months, and in doing that I have been set free from restrictions I have placed on myself. God has done to me what he has done to the Eucharist. He has taken me, broken me, and blessed me, so that I may share what I know with the world. Today, I am meeting with one of the doctors who cared for me. I am hoping he can fill in the many blanks I have from the details of my ordeal. I will blog about that soon! “Why did this happen to me?” That question seems selfish on the outset; presuming that being the victim of a situation, circumstance, or suffering is a bad thing or something unconscionable. This is a fallacy uprooted by the Christian faith through belief in the life, death, and resurrection of Christ. It is only in retrospect that I have begun to understand, through grace, how mysterious and awesome the Divine Plan is in the furtherance of the Kingdom of God. I will present a timeline of events interweaved with my feelings and inclinations throughout this terrible and amazing experience. Around 4:30 AM my wife, Melanie, began to feel stronger contractions that were a prelude to full-blown labor pains. The culmination of months of appointments had finally come. We began the long trip from our home in Tempe to Mercy Gilbert Medical Center. Once we arrived, we were taken to the triage room of the labor and delivery department where the nurses determined that Melanie was far enough along that she would be admitted and given a room. Melanie and I hit the phones, contacting everyone that we wanted present as well as those close friends and family that could not be at the hospital, asking all to pray for us. For every contraction that occurred, Melanie would offer her suffering and pain for the reparation and graces for many of our infirm or struggling loved ones and friends. It was beautiful and a marvel to see. I recommend this for all expectant mothers and fathers. The early morning hours at the hospital were strikingly similar to the way things transpired for the birth of our son nearly three years ago. There was no cause for concern as the labor was progressing easily. Once we received a room, Melanie requested the epidural. Twenty minutes later, the anesthesiologist entered and relieved Melanie of the pain that had been growing significantly over the past couple hours. Melanie then updated many friends praising the invention of localized anesthesia through text message. Right around 6:00 AM, Melanie’s parents arrived at the hospital with news of who else was en route to arrive at the hospital. As we waited patiently for the labor to continue to progress, at 7:00 AM, Melanie’s OG/GYN arrived and informed us that she was progressing rapidly and thus ruptured her bag of waters. When the attending nurse was reviewing some information with us and checking on my wife, Melanie indicated that she was feeling that something was wrong, was light-headed, and felt somewhat nauseous. At that point, my father-in-law took our son out of the room to prevent him from witnessing his mother vomit. At approximately 7:30 AM, Melanie stated that she felt as though she was going to pass out. At that point, the nurse attempted to reposition Melanie and try to determine the cause of her light-headedness as there was no indication from her vitals that something was amiss. Melanie then slumped to her side, having what seemed like mild convulsions to a layman’s eyes. I was standing at the end of her bed as I witnessed her heart rate and blood pressure flash zero on her monitors, as well as our unborn child’s heart rate begin to plummet precipitously. As I looked back at Melanie’s face, her skin had turned a deep blue. I knew then that she was not breathing and had no heart rate. I had seen enough movies to know that this was not good. I watched as a team of staff, five or six, wheeled my wife out of the room and two doors down to the operating room in attempts to save her life as well as my daughter. I remember saying a simple prayer through my tears stating, “God, I know that this is more than I can handle, which means you have a plan and a purpose in this, and I trust you; but please, if it is your will, allow me to hold my wife again.” I have never felt more helpless and afraid in all my life. I had finished my prayer and assessed the room of family and friends in shock and tears as the next two people stepped into the room; the hospital social worker and a priest. I am almost ashamed to say that my first thought was, “I am a widower. They have come to tell me that my wife had died and that they did everything they could.” The only news that they had was that Melanie was still in the OR, but the baby was delivered and in the nursery receiving attention. We all began to pray, holding hands and crying to God and all the saints in an appeal to save my wife’s life. The next person to come in was the general surgeon who indicated that she was simply walking by the nurses’ station right outside our door at the time of the initial incident which made the response to the trauma immediate, which most likely is what saved her life. The right people in the right place, at the right time. She informed us that Melanie had entered the operating room with no pulse and not breathing. She was clinically dead. The team shocked her with a defibrillator with no effect, began CPR, and then shocked her again, which resulted in a faint heartbeat. She had been without oxygen or a pulse for around 10 minutes. They then spent over an hour and a half trying to resuscitate her. Immediately after the prayer I went to the nursery to see my daughter. As I wiped the tears from my face to see her, the first thing I noticed was that she had blonde hair and light eyes; just like her mother. At this time, I did not know if Melanie was alive or dead and the first thing I thought of when the nurses asked me the baby’s name was, “what would Melanie want me to name her?” Without hesitation I replied, “Gabriella”, the “heroine of God”. It was in the nursery that an OR nurse entered and informed me that they had stabilized Melanie and were going to move her to ICU shortly. The head of the ICU came to our room shortly after and informed us that they thought Melanie had experienced an amniotic fluid embolism, which led to a cardiac arrest. I came to find out later from various other doctors that often in an emergency c-section a uterine artery is cut, but it is caught and remedied quickly as it will bleed instantly. Apparently, due to the vascular inflammatory response of having amniotic fluid in her vessels, very little blood appeared during the c-section so no remedial action was taken as there was no call for alarm. We also found out that Melanie was experiencing a condition called DIC, which in her case meant that her blood wasn’t clotting. At the same time, the surgical team transfused her blood to remove the amniotic fluid-tainted blood. As a result of this removal, the vascular inflammatory response ceased and a severed uterine artery began to bleed freely into her now closed abdomen. In the ICU, we were told to prepare our goodbyes as there was little likelihood that Melanie would survive. The rest of Melanie’s family and myself consoled one another and took our time to share what we thought were last moments with her, waiting for her heart to fail again. As noon rolled around, Melanie had received vast quantities of blood thickening products to assist in clotting. Another surgeon was called to perform a sonograms of her belly and noticed that her belly was full of blood. They needed to operate again immediately. Again, the nurses and doctors indicated that there was very little chance she would survive this surgery so again, we said our goodbyes. Miraculously, Melanie survived this surgery as well. The doctors removed 5 Liters of blood from her abdomen alone and were able to identify the bleeding and had to pack down her belly (simply put, they stuffed her belly full of towels to compress the bleeding). They indicated that due to the amount of fluids that they had given, she was very swollen and as result, they could not close her abdomen, thus she was still open on her bed with increased risk of infection. Though I was elated that Melanie was still alive, her brother (a cardio-thoracic surgeon himself) informed me that now that they stopped the bleeding, pressure was regained in her circulatory system. The issue now was that the multiple blood products that she was given for most of the morning had thickened her blood to a consistency like molasses which meant that her heart had to work three times as hard to try to pump blood through her system. My brother-in-law said that she would experience heart and lung failure. I waited and watched as what he said came true over the course of an hour. She had been put on a ventilator since the initial operation early that morning, but now it was assisting at 100%, which meant that she was no longer assisting in her own breathing. Scans of her heart revealed that her ejection fraction was only 5% (normal is between 55% and 65%). I prayed that her muse, the man who supplied the material for her work, John Paul II, would intercede for another morsel of grace in this day already filled with miraculously beaten odds. It was then that I found a quiet place, as my wife was slipping away, and wept. I wept for my children, my family, and myself. As I wept, one of my best friends from my small home town in Missouri walked into view. I gave him a hug and wept some more. I made another heart-wrenching phone call to my father and my friend and I went back into the ICU. My closest companions in the ICU were my in-laws, my friend, and the priests that had been close friends with Melanie since their high school days. I noticed that my brother-in-law was on his phone frequently and pulled him aside to ask what was happening. He stated that he was organizing a transport for Melanie to the Mayo Clinic Hospital Critical Care Unit. I told him I trusted his opinion and asked him to make it happen. He had organized a “hospital on wheels” to come from Mayo to Mercy Gilbert (an hour drive) to assess and transport her that night. They arrived and agreed that Melanie would not have to be put on a special type of heart and lung machine as medications were stabilizing her enough for transport. Knowing that it was an hour-long drive and her heart and lungs were hanging on by threads, we said our goodbyes for a third time. My friend drove me to the Mayo Clinic and we arrived a few minutes before Melanie arrived. We found in the waiting room more friends, one of which handed me a pouch and told me to hold on to it as long as I needed it. I opened it to find a medium-sized crucifix with first class relics of five different saints (Saints Paul of the Cross, Gemma, and Maria Goretti to name a few). Shortly after this gift, a team of doctors slowly entered the waiting room to discuss Melanie’s case. By now it was around 9:00 PM as every one of the doctors and surgeons listed their plans for helping Melanie recover as best they could. They advised that it may be too little, too late and that even if she survives, there may be severe brain damage from the period of time her brain was without oxygen earlier in the day. We dispersed after the doctors’ report resigned to the fact that she was stable and that nothing could be done until morning. We attempted to sleep wherever we could for the night. I arose after about two hours of sleep to news that Melanie would be going into another surgery, her third, to remove the packing from her still open abdomen, assess the damage and potential bleeding, as well as attempt to close the wound. The nurses from this surgery informed Melanie a few days later that they had never seen anyone live through the surgery they participated in, let alone heard of anyone live through each of the surgeries she underwent over the initial 24 hours of her ordeal. Just prior to this last surgery, the ICU staff informed us that they would be trying to withhold some of the sedation to more accurately assess Melanie’s neurological state. I was told by staff prior that if Melanie had in fact experienced an amniotic embolism, the fact that she survived the initial cardiac arrests was a miracle, but the very few who do survive are likely to be permanently and severely neurologically impaired and perhaps brain-dead. So needless to say, I was again prepared for the worst, but prayed for another miracle. As I entered Melanie’s room with her sister, I saw that her eyes were open and looking around. I simply said, “Hey babe.” Without hesitation, she turned and looked at me and her eyes began to well up with tears. I was elated, but I knew I wouldn’t have much time as she would have to be sedated again for another surgery she may not make it through. I went immediately to her side and saw that her arms had been restrained to prevent her from taking out her ventilator tube or any other IVs or monitors. I simply told her that I loved her and that I was so proud of her. I tried to calm her down and asked her simple questions to which she nodded or shook her head. It was clear to me at that point that my wife was not brain-dead or even neurologically impaired. Melanie’s sister saw this exchange and ran to the waiting room to get a picture of Ella for Melanie to see before she was taken to surgery. It may have been the only opportunity for her to see her daughter if she didn’t make it through the risky operation. Melanie’s sister came rushing back into the room with her Blackberry and a picture of Ella. We showed it to Melanie and she began to cry. She was trying to twist and turn to get out of her bed and had to be sedated again to calm her down so that she didn’t cause any more problems as her abdomen was still open all this time. They wheeled her off to surgery and, for the first time through all this, I felt some optimism and hope, despite the low probability of her survival through the surgery. Melanie’s sister and I returned to the waiting room with smiles and tears streaming down our faces. We shared the experience with loved ones and friends and the mood was joyful and prayerful. Looking through the waiting room I saw almost every person, at one point or another, whisper a quiet prayer of thanksgiving to God for further evidence of his mercy and grace through this situation. It was beautiful. After about an hour, one of the operating nurses came to see us to inform us that the surgery was going well, but the doctor still anticipated another hour or so to complete it. Prior to the surgery I was asked to sign a consent form in which, in the case of dire necessity, would allow for a full hysterectomy. That thought dwelled in my mind though the surgeon stated to me that the chances of that were remote. I was not sure how Melanie or I would react if this great defender of the womb would have to have hers removed after birth. A little over an hour later, the surgeon was going to consult us in a private room to discuss the surgery. He met with my in-laws and myself and stated that everything went very well; there was no additional bleeding, no hysterectomy needed, and no obvious infection despite being open for almost 24 hours. I felt like Job in the face of doubtful friends holding on to his faith and trust that God would not forsake a faithful servant. Melanie is truly a good and faithful servant. With this surgery complete, her wounds closed and her heart and lungs recovering, a miraculous recovery began to unfold. Within the next 24 hours, Melanie was weaned off of all medications except for pain medication. 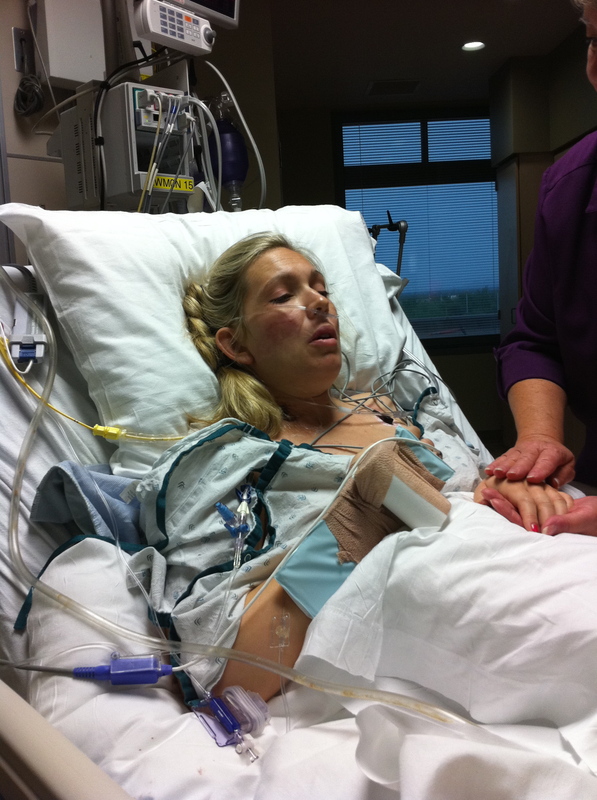 She was breathing on her own and had her ventilator removed. She was talking and was allowed to move from her bed to a recliner. I got word that her ventilator was being removed while I was on the road between Mayo Clinic, Mercy Gilbert, and our close friends who were watching our son, Brady, while this was all going on. I opted to let my sister-in-law continue to care for Ella at Mercy Gilbert because I wanted to be at Melanie’s side to speak to her. With that, I left to let her rest, but of course with my wife that didn’t happen. She allowed the parade of family and close friends come to see her and continuously stated that she was going to “get out of here” soon. She was also not quite clear as to what she had been through and her short-term memory was barely intact, which was all normal for trauma patients and was back to 100% within a couple of days. 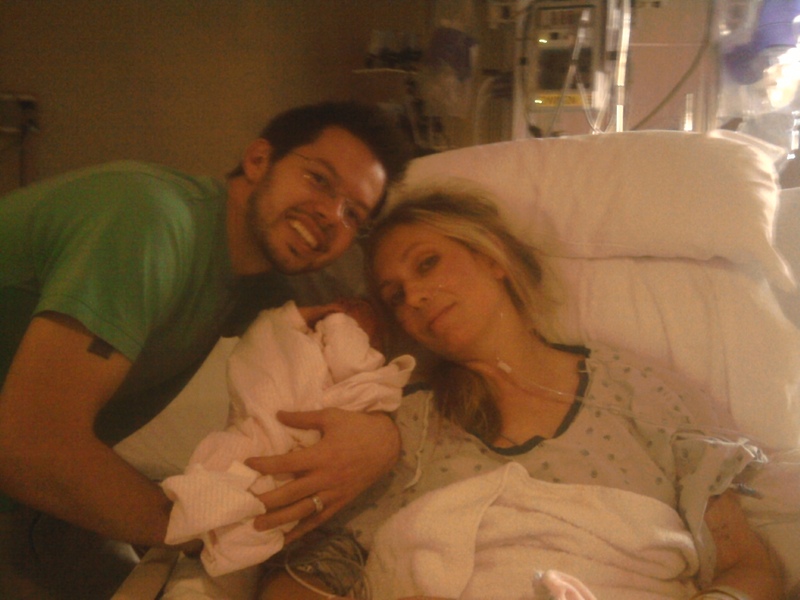 That night, I woke up very early and went to Mercy Gilbert to bring Ella home. As we were getting discharged, many of the nurses that assisted us came to say hello and shared beautiful stories of prayer and how this situation had touched their lives deeply and permanently. It was amazing and caused my oft-repeated response to the overwhelming support and prayers; all glory to God and His great mercy! Ella and I made the trek to Mayo Clinic so that Melanie could hold Ella for the first time. We arrived and walked through columns of friends and family in the waiting room eagerly anticipating the joy that would be felt in this reunion. I brought Ella back to Melanie and Melanie began to cry and though I knew that at this point that she would most likely not remember the event, I permanently etched that image in my memory and asked a friend to take a picture. If any of you know my wife, you know that she rarely remembers small events unless there is a photograph to prove it. I wanted her to see that moment and know that she was as happy and joyful as I had ever seen her. From that day on, Melanie’s recovery was progressing rapidly. Aside from sleeping, Ella was with us at Mayo throughout the rest of Melanie’s stay. Brady and Ella were now both staying at our house under the watchful eyes of my mother, who had flown in from Missouri, and Melanie’s mother and sister. On the morning of August 3, 2010, Melanie was discharged from Mayo Clinic to continue recovery at home. Our world and the world of many others had changed significantly over the past six days. I thought to myself, how appropriate that Melanie would be allowed to rest at home beginning on the seventh day after this, her own resurrection of sorts. God is good! The doctors indicated that Melanie would recover completely from the surgeries, but her heart function would take more time to recover. They prescribed one medication to help her heart recover. In recent follow-up appointments many of the doctors we spoke to used the term miraculous more than once in our conversations. That took me by surprise, but I knew that what they could not explain, we could, thanks to faith. The doctors did provide Melanie with a monitoring device with a defibrillator for the remote chance that her heart would have another cardiac arrest episode in the next three months. They do not think that will happen, and expect her heart to make a full recovery in that time. Whether this event means that Melanie will have to take a pill for the rest of her life to regulate or assist her heart does not in any way cast a shadow or doubt on the series of miracles and graces poured out upon her, our family, and the thousands of people who have been praying and supporting us! God has allowed Melanie to be the lighthouse in this storm of life to bring many stranded souls back home to the Heart of Jesus. I have been blessed in the sense that my wife and children are alive and well by His grace. I have written this account to assist in my own healing, the healing of others that may relate in some way, and for documentation should any be requested of me. All glory to God! Please continue to pray for us and especially pray for those families that have had similar experiences in which the outcome was different. Pray for all families and mothers. Never stop praying! When I was in high school church youth group, the question was posed “If you were on your death-bed, who would you need to call or what would you feel like you would need to take care of.” Hands raised as people responded with an assortment of things, however, one wise person answered “I wouldn’t need to call anyone or do anything because I live everyday as if it is the last.” That always stuck in my brain. On July 28. 2010, my father’s birthday and on the day my daughter was born, I died. It was during my unforeseen death that the delivery of my second child occurred via c-section. I will never have the experience of seeing my second child being born, hear her first scream, or hold her in my arms for the first time because I had disappeared from this life. Minutes later, through the intense and dedicated work of a doctor performing chest compressions on me, I was revived. Although alive again, I was still unconscious to what was going on in my surroundings. Matter of fact, I wouldn’t have a full conscious memory for days to follow. And, even then, my memory was limited to days before my delivery. I had been absent from conscious memory of life for at least three days. Now that I have seen the face of death, I have to ask myself the same question posed in high school. Matter of fact, I have been asking myself many questions. Did I love my husband enough? Did he know it? Did my children know their worth and how much they meant to me? Did my family feel my love and respect for them? Did my friends know how much I cared about them? Was I a good friend? Was I a good citizen? Was I true to myself and my word? Did I make a difference in this world? Was I faithful to God and to living my life in a way that was pleasing to Him? These questions and more are ones I have come face to face with during my days of recovery. The answers to all of these questions are that I tried my best to be a good wife, a good mother, a good family member, a good friend, a good citizen, one who is true to her word and faithful to God. Had I died, I could have died in peace knowing that nothing went unsaid and that I lived an exciting life for the Lord with the ability to make a difference in this world. Why God chose to keep me alive is one thing that only the future will tell me as I feel a renewed purpose. Maybe my death was an awakening for me to simplify my life, or an awakening that God has more plans to use me, or maybe it was an awakening for me to not just be a good wife, a good mother and etc., but a great wife, a great mother and etc. Maybe I was just a pawn in a bigger plan that God had to bring others to their knees in prayer, to rely solely on him, to realize their limitations and inability to control. Maybe it was a reality check that God is in control, that He is in charge and He wants his children to come home to Him by hitting their knees to the floor, pounding their fists in the air, praying to Him with unceasing devotion. Maybe this wasn’t about me, but about all of us. To hear that I was the number one Googled persons in AZ for a day, or the top 100 Twittered persons,, or that churches held prayer services around the world for me, that I was prayed for on radio stations, or that hundreds of people who I don’t know requested to be my friend on Facebook and wrote to tell me how hard they prayed, will forever astonish me. Total strangers who forwarded e-mails about my condition to others requesting prayers. People I know and don’t know donated money generously. Ones I know who don’t have extra money, gave to me to ensure my medical expenses would be taken care of. This to me is the extraordinary, the unexplainable, the miracle! What I have witnessed while being back in this life is truly this most beautiful! And the greatest miracle was not that God brought me back to life, but that He brought so many back to Him through this situation. A community of people around the world who had come together even if for a moment in time to pray, to hold their families a little closer, to believe in the impossible, to believe that miracles can happen. If this is all that ever comes from all that I have had to endure through this, it will be enough to know that the human condition is good, is wonderful, is beautiful, and that we have the ability to love a stranger in ways maybe we never knew were possible. That we are truly God’s children connected by our inheritance given to us by the greatest lover and maker of all time…our Father in heaven. Eleven days ago, I went to Mercy Gilbert Hospital to deliver my baby girl. It was an exciting day, and it was also my dad’s birthday! Soon after getting there, I complained of feeling sick and that is when the trauma began. My husband has written an account of what really happened to me because I have no memory of it at all. Soon I will post that for those of you who want to know what exactly transpired. Not only did God spare my life, but he also spared my memory. When I woke up in the hospital, I had thought I had given birth and was asking physicians if I could go home that day. Eventually my family explained that I was at that Mayo Clinic and how critical my recovery was. I was astonished but not quite able to comprehend it. A few days into my recovery at Mayo Clinic as I was trying to make sense of it all and take in what had happened to me, two nurses were hovering over me while I was asleep and Gabriella, my new-born, was asleep in my arms. I opened my eyes to these women who looked at me with the most loving and compassionate eyes. Once they saw that I was awake, they said, “We were your surgical nurses. We have been praying so hard for your recovery.” Instantly, I thanked them with incredible gratitude. They went on to tell me that in 25 years as working as surgical nurses, they had NEVER seen anyone live through what I experienced. This was the first time being in the hospital that the seriousness of my condition set in, and I realized what a miracle had happened. As I heard about the family and friends who flew out from different parts of the country to be with me immediately and the ones who came from all over town to sit in waiting rooms and pray for me. Then, if that wasn’t enough outpouring of love and support, I found out about all the people all over the world who had been praying for me. I found out about the prayer services and masses said in my honor and conferences that stopped to pray for me across the country, and people like one of the workers at the hospital who had heard my story and never had been to adoration in his life, but that night went to the chapel and prayed for me for 3 hours. He was a total stranger who united himself with me in prayer. I am completely overwhelmed by the outpouring of prayers, love and support. On top of that, by the time I had been discharged out of the hospital, hundreds of people had donated to my medical costs. I am so humbled. Your prayers saved my life! 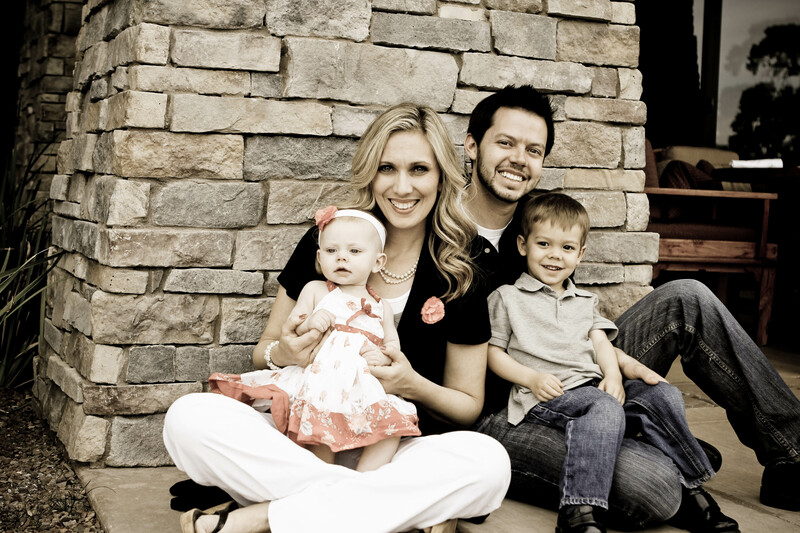 They saved my husband from having to be a widower with two small children. They saved my father from losing his daughter on his birthday. They saved my children, mother, brother, sisters, nephews, nieces, grandparents, aunts, uncles and friends from losing me. I firmly believe that the evil one had a plan that day to take my life, but God’s infinite mercy, the hands of incredible doctors and surgeons, my priest friend’s who brought me communion, and the faithful community with incredibly selfless love, support and prayers squashed whatever plans he had. Now I am on the road to recovery. It will take some time, but I am dedicated to LIVE! I have a heart condition now that I am taking medication for. Because I suffered two cardiac arrests, there is a 50% chance of me having one again, so for the next three months I will be wearing a portable defibrillator, so if my heart does stop beating again, it will automatically shock me back to life. I met with a heart doctor a few days ago, who told me that he is having me wear this device as a precaution, however, my heart “miraculously” (his word choice) is already showing improvement and where they would normally put in an implanted defibrillator in my heart, they are choosing not to because they think that my heart may fully recover in three months, which is nearly unheard of. Please continue to pray for the recovery of my heart and my body. Last night, my good friend Fr. John Muir held mass in my house for my family since I am homebound for a while during recovery. He said the most profound words in his homily. The second reading was the story of Abraham and Isaac. Abraham had a blind trust in God who was asking him to sacrifice his son’s life. In the end, God stopped Abraham from killing his son, and Abraham showed an incredible trust in God’s plan. Eleven days ago, Fr. Muir with the assistance of my other great friend Fr. Parks, administered the sacrament of anointing of sick on me in the hospital, and in Fr. Muir’s homily last night, he spoke of how my mother, my father, my husband, my brother and sisters were much like Abraham when they were asked to say their goodbyes to me that night and to trust that God had a bigger plan. God gave me back to them and to all of you as a symbol of God’s trustworthiness, of His resurrection, His power and His grace. Each one of you who have stayed by my side in prayer, who have kept up with my recovery and who have sent me letters, facebook entries, twittered about me, sent e-mails and etc., I thank you, and I will pray for you my faithful friends and community! You truly have changed my life! First picture taken of me while in the hospital. Melanie. . With tears in my eyes.. Can’t stop them from still falling. . What I read tonight, feels so familiar.. And yet I don’t remember any details of my survival story..I need so much to know them.. From the blood loss to the army of people God sent to help me live.. I would so much like to speak with you. God Bless you.